How to avoid yet another helping of alphabet soup. 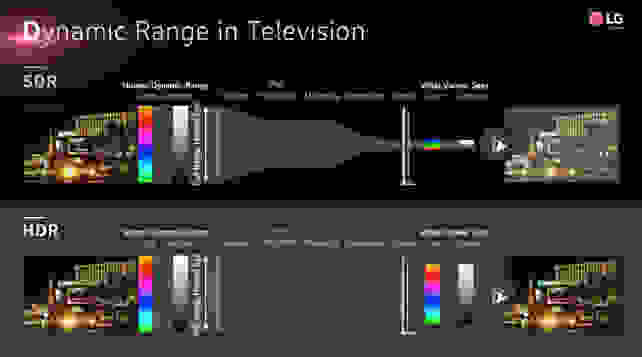 Journalists from the around the globe gathered at a hotel in Berlin this week to get a glimpse into the confusing, acronym-riddled world of High Dynamic Range (HDR) television. Dr. Nandhu Nandhakumar, Senior Vice President of the LG Technology Center of America, led the presentation, walking the crowd through a series of highly technical data points. While most of the audience was able to follow along, the average consumer certainly won't. There's no doubt that HDR is an amazing advancement in television technology, but explaining the benefits in an easily digestible way remains a challenge. Explaining the benefits of HDR in an easily digestible way remains a challenge. So what can be done to educate consumers without boring them to tears or dumbing it down too much? That's the challenge facing both TV makers and consumer advocacy sites like Reviewed.com. For our part, we're working on a comprehensive explainer article. But in the meantime, we hope this explanation from one of LG's top minds helps. But LG is hardly the only TV brand working on HDR—it just happened to be the one yelling loudest at IFA 2015. Samsung, Sony, Panasonic, and all the other major players are developing HDR displays, as well, and it seems likely that the tech will be as ubiquitous as 4K in just a few years. As with 4K and 3D before it, content is one of the biggest obstacles to HDR adoption. You can buy the newest, fanciest TV in the store, but what can you actually watch on it? Fortunately, HDR now has some standards around which everyone in the content creation chain—camera makers, post-production houses, content distributors, and TV makers—can rally to ensure compatibility. That means a steady stream of HDR content should begin arriving very soon. At its own press conference last week, Samsung announced that all of its 4K UHD TVs will be able to display content from external HDR sources via HDMI 2.0a. Not coincidentally, the company also outed its first UHD Blu-ray player, which can deliver HDR content. Finally, it touted a partnership with 20th Century Fox, which will be releasing all of its upcoming movies in HDR UHD. Is HDR an enormous leap forward in TVs? No, probably not—at least not compared to the switch from standard def to HD, or even HD to 4K. Rather, it's one of a wave of concurrent advances—including wide color gamut—that will add up to make everyone's viewing experience just a little sweeter.